United Kingdom: Quintessence Publishing Co. Ltd.
Czech Republic: Quintessenz Nakladatelstvi spol s.r.o. Poland: Wydawnictwo Kwintesencja Sp. z o.o. South Korea: Quintessence Korea Publishing Co., Ltd.
Have you forgotten your password? Use the resend-function to receive it again by e-mail. If you do not have a username and password, please register first. Searching and buying in the shop is also possible as a guest without registration. This comprehensive review brings together research by biomaterials experts in various fields of dentistry, including oral and maxillofacial surgery, orthodontics, periodontics, prosthodontics, and restorative dentistry. 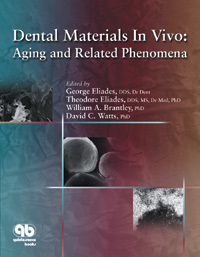 Through the presentation of evidence derived exclusively from in vivo studies, the mechanisms governing the aging of materials placed in the oral cavity are clarified and selective aspects of the in vivo performance of materials demonstrated.